Filed under chip on August 13, 2016. The PocketC.H.I.P. keyboard can be a bit of bear when trying to enter long commands in the Terminal. C.H.I.P. comes with bash as the default Terminal shell (as do most Debian Linux distributions). However, we are not confined to this shell. You can install others and the one I find particularly suited to the PocketC.H.I.P. is a shell called fish. That’s right, fish and C.H.I.P.s! What could be more tasty? This combination will shorten lengthy commands and make that PocketC.H.I.P. keyboard more enjoyable to use. There is much more to explore and users whose Linux-foo is stronger than mine will appreciate the additional features. Browse the fish tutorial page to learn more. The fish shell is now ready to use. 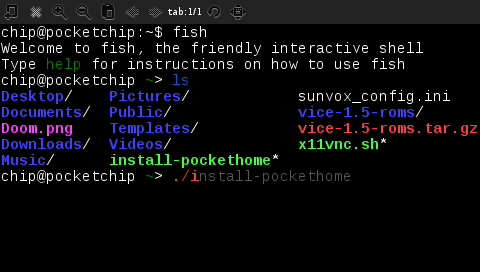 Use fish and issue Terminal commands. Give it a shot and type the ls command. As shown in the image below and on your own PocketC.H.I.P., the list is now color coded and syntax highlighting is in effect. The effect is really great on the PocketC.H.I.P. screen. Try the sudo command next. The fish shell will “autosuggest” the remainder of the string. 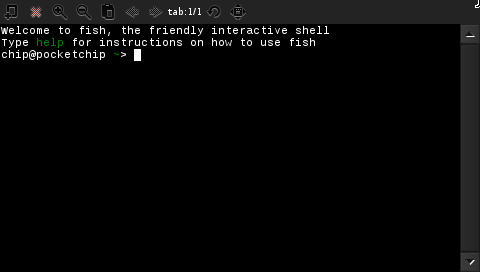 If the fish shell autocompletes the command you need, hit the ⇥ (tab) key and it will complete the string. A real thumb-saver on the PocketC.H.I.P. keyboard. You will receive a prompt to enter your password. Use the default chip password (unless of course you have changed it). Reboot the PocketC.H.I.P. and launch the Terminal. You will see the Welcome to fish prompt appear as shown in the image below. 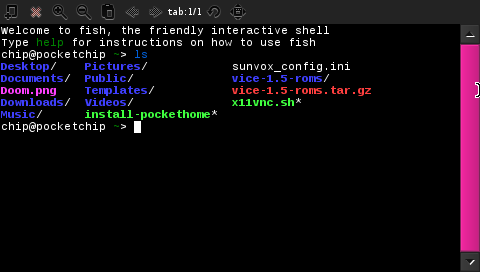 This indicates that fish is now the default terminal shell. I’ve used the fish and C.H.I.P.s configuration for about a week and really like it. I’ve installed fish on both my regular C.H.I.P. and Mac with additional plans to add to a couple of Raspberry Pis. The features fish provides are great for all keyboards; however, if I had not been looking for a way to reduce typing on my PocketC.H.I.P., I would never have been exposed to this wonderful bash shell replacement. Chock up another good learning experience to the PocketC.H.I.P. Anyone else using fish? Share your tips and tricks in the comments below so we can share ways to get the most out of this shell and our PocketC.H.I.P.s.